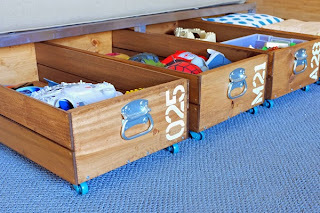 Here's a great DIY to help with additional storage! The best thing about these are they can roll under the bed, day bed, closet floor or wherever you have wasted space and need added storage. Make as many or as few as your space can accommodate. For the complete tutorial and materials list, visit Jackie at Teal & Lime by clicking on the photo below!